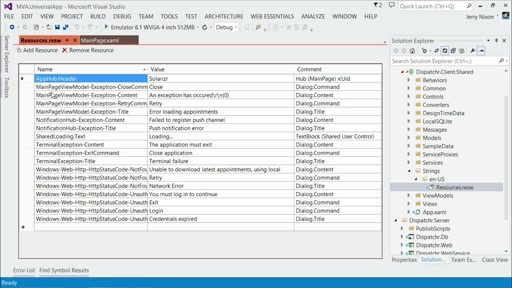 Play Developing Universal Windows Apps with C# and XAML: (13) What else might we have done? Take a look at additional technologies that could have been included in the Solarizr app, had there been more time. Learn how you might include these technologies in your apps. What an absolutely fantastic series. I love the "Excitement & Humour" that the presenters bring to this series. It really makes it easy to spend the hours going through all the videos. 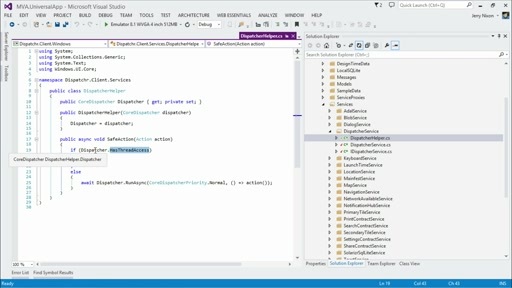 I did however want to look at the services that were showcased in the videos, and I noticed that that the source was not up yet at xaml.codeplex.com. any ideas when you guys will have it up? After watching the series, I do have one question for the presenters. All Prism Lob applications that I have written, have always used the great and fantastic RegionManager and Prism regions. I would normally create a ShellView and provide it with a region or regions where navigation would take place. I had a look at the bits in Prism for RT and have noticed that the greatest component that Prism had (My Opinion) is not there. However after building with a specific style, I would love to know whether using Prism RT and perhaps adding a Frame in the xaml, whether we could use the Prism navigation service to navigate within that Frame. Thanks again for this wonderful series.